Christmas is just knocking at our door and we have to be prepared to welcome it gleefully! The real fun of festivals and holidays can be best enjoyed with family, friends, and well-wishers. Their wishes make our festival brighter, and more glamorous. However, we also to give them something as well in return which can be cherished by them for long. Now with the advent of technologies, the way of expressing love or sending wishes on festivals have also changed a lot. So you can try something different this time. This year try Christmas HTML email templates to wish happiness and prosperity to your dear and near ones. These email templates are really fascinating in design and look and can be given to anyone; from office boss to neighbor or from colleagues to your house physician. They are so professional and yet so beautiful that they will definitely ring the festive bell in the recipient’s mind. There are lots of sites on the internet who offer free Christmas email templates from which you can choose your favorite one. You can also design your own email templates if you have enough skill in HTML. But normally people like to have them downloaded from reputed sites that have a wide array of these types of templates. You may think that if they are free they may not as good in quality as those who come with a price tag! However, the truth is that all that come for free are not bad or ordinary in quality. There are lots of websites out there on the internet who design and offer special Christmas HTML email templates only for this occasion and offer them for free. Of course, there are some restrictions in services as they are “free” but they are not “poor” in quality and you can have my word on that. There are other benefits of these email templates too. You don’t need to go anywhere to wish anybody. Just a few clicks of the mouse of your computer will be enough to send emails with those templates. Of course, as there are lots of websites who design and offer this service you have a great variety to select while choosing free Christmas email templates for your close ones. There are many email builders to create email templates. So this year you try this out and add something new to your wishing style and be a trendsetter. 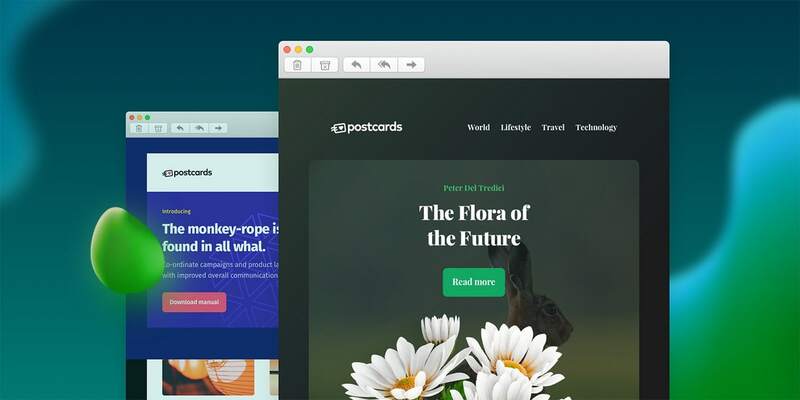 Using Postcards, you can create beautiful emails/newsletters templates (builder) in minutes with drag and drop features and ready-made modules. The email newsletter is really underestimated and I rarely see websites, blogs using it as a marketing and communication tool. Sometimes it is worth spending little cash to get advanced and tested features without any efforts so you could focus on more important topics. For that topic, we should even create a dedicated article, but I will start with just showcasing really well designed premium Christmas e-mail newsletter templates this time. Even for experience designers, building email newsletters isn’t easy. You receive a lovely looking design, and you crack on with the development. Unfortunately, it just doesn’t work as it should in every email clients. Styles don’t display, images aren’t visible, etc. Every template has been thoroughly tested in more than 20 of the most popular email clients like Outlook 2010, Gmail, Lotus Notes, Apple Mail, the iPhone, and more. Feast Mail is an exclusive Christmas email template with business style! Snowy style with exclusively designed Christmas collages is a great possibility to make warm relations with your clients by sending them a beautiful Christmas greetings email! The business style will perfectly fit your everyday and promotional business email. The clean and modern design will make your company or product looks successful and wealthy! Holiday 2 HTML Email uses my user-friendly Modular System so that you have almost infinite layout options – video tutorial supplied and colors include both Red and Blue – Bonus Photoshop files, templates and so much more! Welcome to the Holiday Season! This premium HTML Email Template is specifically designed to help you or your clients to promote a product, send seasons greetings or to just use for your company newsletter during seasonal times. The template comes in 2 flavors, a multi-column design with full-width header, 3 column, and feature area plus a simple full-width version for larger simpler layout. Also included are the same templates with added tags for Campaign Monitor. Bestow Holiday greetings upon your customers with Humana. It’s a combination email template blending a greeting card for the Holiday’s and a small Corporate Newsletter to announce anything new or on special to your customers. Send your subscribers greetings for New Year, Birthday etc. Proper PSD with layers, slice with proper names, made in such a way so editing different items are very easy.